If you’re thinking about adding a pool to your home, planning is critical. There are several aspects that must be taken into account before you take the plunge and buy a pool. You’ll have to set a budget, learn of the various kinds of pools and what is going to work better for your home, find a reputable company to install or build the pool, and much more. If you’re thinking about investing in an above ground pool, you might have the ability to do the installation on your own with the assistance of friends. But, in-ground pools will likely require an experienced pool builder. Before you make the choice to invest in a pool, take these tips into consideration. A pool is going to cost a significant amount of money and isn’t usually an investment where you’ll recoup the funds spent. Make a wish list of all of the features you’d really love then choose what’s feasible. Establish a budget. While you might have a list of features you’d like the pool to have, they might not be within your budget. Conduct research on the various kinds of pools. There are many kinds of in-ground pools, as well as above ground pools. If you choose an in-ground pool, locate a reputable company like UV Pools that may do the work. Take weather into account. If you reside somewhere that has frequent cold temperatures, you might consider a warmer pool. If you reside somewhere that has harsh winters, your pool will have to be closed for a portion of the year using a protective cover. What is going to be the pool’s primary purpose? Will the pool mainly be used by children or is it being put in as an architectural feature? Do you want to create a peaceful retreat space? Consider those questions as you plan a pool to set up a concise sense of purpose which will aid in your planning. Determine a pool shape. Generally, above ground pools are oval or round; however, in-ground pools are available in a number of shapes. As you decide on a shape for the pool, think about what its primary uses are going to be and what you’d enjoy the aesthetic to be. A rectangular pool is better for swimming laps, whereas kidney and additional shapes help your pool better mix with surrounding landscapes. You establish a budget, yet you also have to think about long-run expenses. You’ll have to buy chemicals to keep the pool water clean, the filter must be plugged in, which results in higher utility bills, and much more. Be certain that you call your insurance provider. Having a pool installed in your home’s backyard might affect the homeowners’ insurance policy, and even if it doesn’t, your insurance provider ought to be informed that it’s being installed. 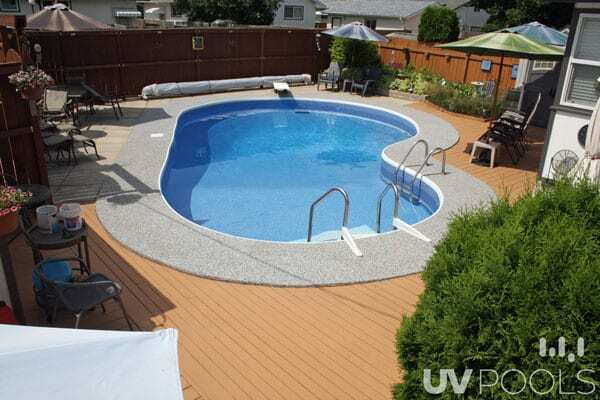 For more information on top decisions to make when buying a pool for your backyard contact the best pool liner contractor in Winnipeg, UV Pools today!